I concur, one journalist wrote about Tiger Woods and specifically in relation to his management of anger. He reckons Tiger walks ten paces and in that space he can vent but after the tenth step its gone moving on, next shot!!. I would like to know how you deal with playing partners who get out of hand and just want to ruin everyone’s day? I couldn’t help myself the other day when a playing partner was HAVING A TANTRUM, I think it effected my play I didn’t want to shine I guess because I thought I was going to make him feel even worse. I don’t know but it felt awkward to compete when some one was feeling so much pain. Usually when im angry it lasts about 3 minutes but thats not much time. Usually afterwards i forget it completely. There are some who hold that anger is a product of fear. One quote I find helpful comes from Yoda of Star Wars fame. He says, “Fear is the path to the Dark Side. Fear leads to anger. Anger leads to hate. 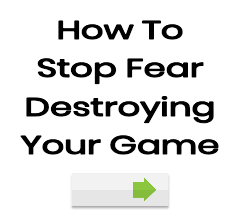 Hate leads to suffering.” If anger truly follows fear, maybe it would be helpful to review Cameron’s book: “The Golfer’s Nightmare; How to Stop Fear from Destroying Your Game”. It ties in nicely with our conversation here.